Sidstream® High-Efficiency Nebulizer Designed to provide the maximum aerosol quality and respirable output for any nebulizer treatment. 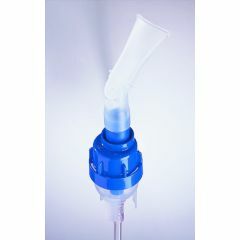 Each high-efficiency nebulizer is supplied with 7' (84") tubing and a vent seal adapter for use with ventilator applications. Disposable. Inexpensive. Long life. Easy To Use. Effective. Good Value. This is the best neb kit I've found not only are they durable but they give me a better flow then standard neb kits. I'd definitely recommend this product to anyone, especially for asthma patients who need their solutions delivered fast. I've bought these several times and will continue to purchase them! Long life. Attractive Design. Inexpensive. Easy To Use. Good Value. The best I have found for durability and effective use. Takes way too long to use. by Pogo Possum from Evansville, In. does not effectively use all medication. I found this to be of a lesser quality than the nebulizers that are of "single use" type. High priced and leave a lot of the medicine in the bowl. Does this tubing fit on the mini- plus?